NBC 6's Andrea Cruz has the latest from the scene in Riviera Beach, where FBI officials say a man was caught and a doctor was shot. 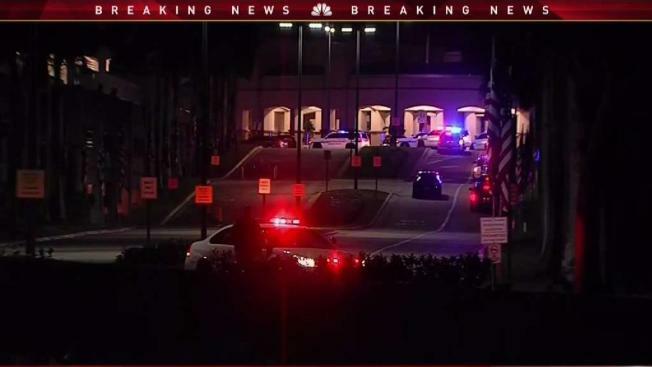 A double amputee pulled out a gun he was hiding in his wheelchair and opened fire Wednesday evening inside a hospital in Palm Beach County, striking a doctor who was trying to subdue him. The shooting happened at approximately 6:20 p.m. at the VA Medical Center in the 7000 block of North Military Trail. Officials say Larry Ray Bon, 59, of Michigan, arrived at the VA Medical Center in Riviera Beach on Wednesday morning and was combative for hours, according to the FBI. Authorities said Bon was taken to the emergency room that evening for the mental health evaluation, when he pulled out a gun and shot the doctor in the neck. "During the shooting, in between shots, the doctor saw an opportunity to jump on the suspect and disarm him," Justin Fleck, the assistant special agent in charge for the FBI's Miami office, said in a Palm Beach Post report . "He's a pretty heroic individual and probably saved a lot of lives," Fleck said. Another hospital employee was grazed by a bullet. VA spokeswoman Mary Kay Rutan says the doctor was treated at a West Palm Beach hospital and released. The doctor's name was not released. The medical center was scheduled to open for scheduled appointments Thursday. Bon refused to cooperate after he was taken into custody, authorities said. According to online court records, Bon's only history in Palm Beach County's legal system was a case in small claims court in 2017 that was dismissed. His name did not appear in county jail records. It’s not clear if Bon has an attorney.